should go ahead and post pics of the 3 cartridges we have been talking about. 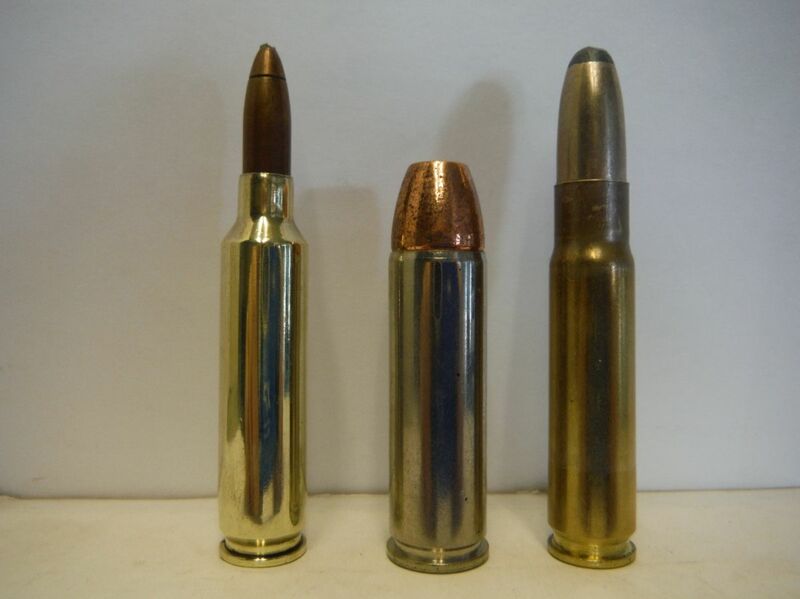 left to right..257 Firecat, 500 S&W, and 366 Firecat. The 257 Firecat is the new cartridge for the new AR-10 rifle and will also be available in the Encore. A 243 case necked up to .257. The 500 S&W is the cartridge in the new Marlin lever action. I think Huey was the first to guess this one right but a couple of you were close behind. The new 366 Firecat is the projected new cartridge also for the AR-10. A 308 Improved necked up to .366. When should I box up my Marlin 1895? Thursday, August 09, 2018, 11:19 (256 days ago) @ Darryl T.
When that cartridge was introduced, I thatcalled Gary for an Encore Rifle Barrel. I had to wait on his reamer to arrive. Its still high on my list of nice guns. Ill definitely add a Marlin in the future. in 500 S&W for a magazine article, 1 blue and 1 stainless. I have the stainless one. Good shooter, felt right at home breaking it in on deer and took it to Maine on a moose hunt. Thursday, August 09, 2018, 13:10 (256 days ago) @ Darryl T.
Can the 366 Firecat be done in an Encore pistol? I loaded the ammo for the test firing I took new 308 brass,lubed the inside neck good, necked it up to 338, then 358, then 366 to get the brass but it worked fine. Still working on the correct load for an AR. How soon will you be making barrels for an Encore? with proof loads first to make sure it is what I expect. Damnit!! I just sold my 1895 a year ago. Thursday, August 09, 2018, 13:46 (256 days ago) @ Darryl T.
Looks like I'll be ordering another Encore barrel. the first one is the old 25SOUPER cartridge, Gary. Dave, to me, is like John Taffin. When either one tells me something, I believe it. I don't need a wannabe "expert" disputing what Dave tells me. Dave Manson says you are wrong. And I agree. I do hope you have good sights on it. What ammo was tests made Gary? And how far? I had, a Big Horn carbine for awhile and was not happy with the plastic rear sight. Some XS sights should work good. I used hand loads and Double Tap ammo. fiber optic front. No plastics. The gun worked perfect with Federal ammo using the Barnes bullet and the Cor Bon ammo.